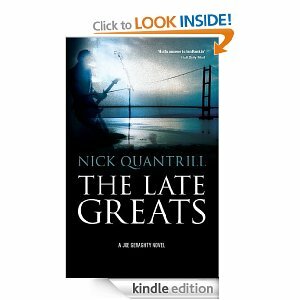 Nick Quantrill is one of the nicest chaps on the crime writing scene. His novels Broken Dreams and The Late Greats are published by Caffeine Nights and both in his home town of Hull. I was lucky enough to be able to interview him for this blog. Tell us about your latest novel The Late Greats. “The Late Greats” is the second Joe Geraghty novel. It sees Geraghty move away slightly from his role as a Private Investigator. He’s employed to babysit a reforming band and essentially keep them out of trouble until the pay-day happens. But the band’s front-man, Greg Tasker, disappears, so it’s back to the day job for Geraghty with him having to find him to keep the show on the road. “The Late Greats” is a novel about friendship, success and how people change over time. How much planning and research goes into your novels? It depends on the novel. My first novel, “Broken Dreams”, was partly about the decline of the fishing industry in Hull, so I read a lot of material for it, visited the Artic Corsair (the city’s floating museum dedicated to the trawler industry) and listened to stories about what life was like for those workers. With “The Late Greats”, the process was different. The backdrop of music made it much easier. Music is a passion of mine, so it was much more a case of simply using my imagination. Both of your novels to date are set in Hull. Why is this? It’s nothing more complicated than the fact it’s home. It’s the city I know best, and to my mind, the novels couldn’t really be set anywhere else without changing the tone of them. I suppose there’s also an element of it being a city that’s not been particularly explored within a crime fiction setting. That’s very much changing, as you can’t seem to leave your house without bumping into another crime writer! Like many more celebrated cities, Hull has just as many fascinating stories to explore. Would you consider writing a novel outside of your home city? There’s a loaded question…it’s for others to judge really, but I work hard on plotting and getting that aspect right. I also work hard on the dialogue, as that’s the one thing that can really kill a book for me as a reader. What are your weaknesses? Where do you feel you could improve as a writer? Again, it’s probably a question for others, but I know writing non-dialogue is something I particularly want to improve at. I want every book to be better than the one before it, so I suppose the answer is I want to improve at everything in relation to my writing. If that wasn’t your aim as a writer, what’s the point? Any hints about what’s next for your PI Joe Geraghty? I’m hard at work on the next one, provisionally called “The Crooked Beat”. I don’t want to say too much, as it’s not done yet, but it involves Joe’s brother, some smuggled cigarettes, fallout from Joe’s partner’s police career and a changing city. If you were to write a soundtrack to accompany your novel what five songs do you feel you couldn’t leave out? The novel writing is the priority, but there are plenty of other things on the go…I’m very excited to be working on a screenplay with a group of Yorkshire writers, including David Peace. There’s a novella coming later this via Byker Books and I’ve got a couple of exciting commissions from Hull’s literary festival, The Humber Mouth, to be working on. Always busy! Where can my readers find out more about you? The best place is my website – www.hullcrimefiction.co.uk, or simply look me up on Facebook.